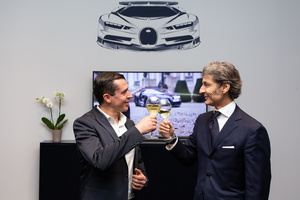 Bugatti CEO Stephan Winkelmann and Champagne Carbon CEO Alexandre Mea have signed off on a partnership between the two French luxury brands at the Bugatti headquarters in Molsheim. 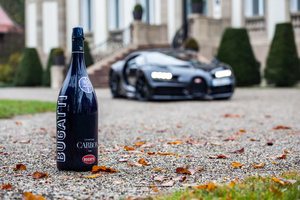 A visible-carbon-fiber-coated Bugatti Chiron and a bottle of the new Champagne Carbon in its carbon fiber wrap bore testimony of this exclusive cooperation. The predilection for carbon fiber composites, however, is by far not the only similarity between both companies. Bugatti and Champagne Carbon are avant-gardists of their respective industry, translating their know-how achieved through a proud history into an innovative present and future. On time for the celebration of Bugatti’s 110th anniversary next year, Carbon created the ‘ƎB.01’ Consisting of 90% Chardonnay and 10% Pinot Noir. Bugatti working at full speed on its modern era revival at the hands of the Bugatti Veyron, while extraordinarily in Champagne, it had the perfect weather conditions for good ripeness and flavor concentration. The creation of a unique and high-quality Champagne Cuvée requires using grapes from the most prestigious terroirs of Champagne, precision, know-how and time. This vintage was just released from the Carbon vinotheque at the optimum maturity.